I’ll start this one off by saying I have never been more in love with my wife than I am right now. Each day spent together is another day of blessings. 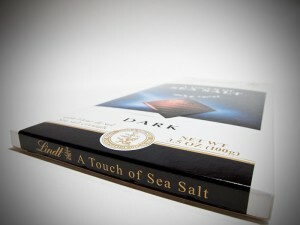 This photo of chocolate with a “touch of sea salt” symbolizes our relationship. It’s sweet with the occasional salty crystal to throw you off. But it’s those “salty” moments that allow us to grow and our love to deepen even more. When mixed together you get a tasty treat. Today being Valentine’s Day I thought it would be appropriate to tell the story of how I met my wife. Way back in the year 2000 I was a lonely single guy working a great job for a company called Dynamix in Eugene Oregon. Dynamix was a game design studio putting out hits like Tribes, Tribes II, Starsiege, 3D Ultra Pinball and RC Racers. I was a network technician there and I can honestly say it was one of the best jobs I have had. There was lots of talent in that office. After work I spent my evenings and nights playing Counterstrike online and drinking Mike’s Hard Lemonade. Yes, I was a cheap nerd. At some point I started having an interest in connecting with people from around the globe. I was curious about what people in other Countries thought about America and Americans. I connected with some really cool people from all over the world including Korea, China, Philippians, Thailand and Indonesia. It was really interesting to chat and email with people from across the ocean, people with different values, interests and perspectives on life. I think that is one of the greatest positive influences of the Internet in that it erases borders allowing people around the world to connect and interact. One evening I came across a personal ad on Excite.com. It was placed by a woman from Bandung Indonesia. Indonesia? Where was that? I’d never heard of the place before. Her ad looked interesting but I clicked on by like I had clicked past so many others. But for some reason this ad kept coming back day after day. I’d click on Excite.com and there she would be. Finally after a week of her face popping up everywhere I clicked I replied and sent a message. I learned and included a few phrases of greeting in Indonesian. I sent it off not really thinking too much about it and not really expecting a reply. A few days later I received an email in my inbox. (I still have all those original emails; the first one arrived on December 19, 2000). Her name was Irene and she had found my email interesting. I won’t go into the details of those first emails but it began the process of us getting to know each other. Then a tragic event occurred in Indonesia over Christmas. Bombs exploded at several Christian Churches and people were killed. Knowing Irene and her family were devout Christians I emailed to see if they were ok. It wasn’t until a few days later that another email arrived letting me know that all was well. It was such a relief. Even though I didn’t really know her or her family I felt a connection developing. Over the next month we exchanged many more emails. I emailed almost every day patiently waiting for a reply. Even though I only knew her via email and photos she had sent I myself falling in love with her. It sounds crazy doesn’t it? But you know what? I honestly believe that everyone has a soul mate that is special just for them. And when you meet that person, be it in person or over the Internet, you will know it and it will click just like putting that last piece of a puzzle in place and finally realizing the entire picture. It isn’t until that last piece is in place that the picture is complete, that we feel complete. One evening I received a phone call. The number displayed as unknown but I answered and a sweet voice said “hello”. It was Irene and she had called me all the way from Indonesia. This began the calling stage of our relationship. I quickly learned the hard way that when calling internationally it is very, very important to make sure you have a calling plan that makes such calls affordable. My first phone bill nearly sent me to the hospital with over $700 in International long distance charges for the first month. At the time I had Sprint long distance so I called them and told them I would be making lots of International calls and needed a really good plan. They were happy to oblige and even kind enough to grandfather in all my previous calls which lowered my bill by over 2/3rds. Had I known about calling cards way back then I would have been a frequent buyer. As it was I was getting 10-cents a minute which by today’s standards is still a bit on the expensive side. Now we’ve got Skype and other similar services where you can call for free computer to computer. February rolled around and I thought I would surprise Irene by sending her flowers. I used 1800Flowers.com and sent a big bouquet for Valentine’s Day. It was a great moment for me to get an email response about how they had really surprised her and made her day. A few days after I sent the flowers we were talking on the phone and I asked her to marry me. Yes, you read that correctly. I asked her to marry me over the phone, from half-way around the world having never met her in person before and only knowing her through emails, phone calls and photos. But like I said, I firmly believe that when you meet your soul mate you will know it and nothing will shake the love you feel or take it away from you. So by the end of February we were making plans to get married in Bandung Indonesia. We decided on a date of April 30th. I would fly to Indonesia on the 20th and that would give us a few weeks to prepare for everything. In March I wired money to her to help pay for everything that was needed for the wedding ceremony and reception. Time was now growing short before I was to fly across the world to a Country I knew very little about. The only thing I knew about Indonesia was that it was located somewhere between Australia and Thailand. I was a little nervous because truth be told the only time I had been outside the US was on a trip to Canada with a YMCA group years ago. Now this was during a time when the State Department was advising Americans to avoid any unnecessary travel to Indonesia due to the potential for violence. Honestly, I wasn’t all that worried. I was excited to finally be meeting in person the woman that I had fallen in love with. I think another aspect was that I was so green when it came to world travel that I had no idea what to expect or anticipate. I was more worried and concerned about the flight. I have a fear of flying and even the thought of getting on a plane gets my heart rate up, my palms sweaty and my mind racing with images of plunging to earth in a fiery ball of twisted metal. The day of departure finally arrived. I would be gone a whole month but had packed like I was leaving forever. Some friends drove me to the Eugene airport and I hopped a flight down to San Francisco where I had a layover of several hours before boarding a 1 AM Singapore Airline flight to Hong Kong. From Hong Kong I would fly to Singapore, endure another 5 hour layover and then a short 45 minute flight to Jakarta. The flight to San Francisco was uneventful and I spent my time in the airport walking around and thinking about and reflecting on the amazing journey I was about to embark on. I thought about the way things had progressed so quickly. Irene and I had met online in December and here it was only 4 months later and I was about to board a plane, fly across the Pacific Ocean to a Country the State Department was warning me to stay away from. As I write this I can’t help but think about how crazy this all sounds. It’s definitely not how I would describe myself. I mean, I’ve never been the kind of person to take risks. Generally I have been a dreamer who has never put his dreams into motion by applying action to them. But I can say this much…this was a period of my life when I felt most ALIVE! I threw caution to the wind, overcame my fears, drowned out the cries of doubt ringing in my head and I went for it. The flight to Hong Kong was long. It seemed like forever before we touched down. As a gazed out the window at the people working below I realized that I was far away from everything that I was familiar with. Today I am beginning to realize that if we really want to feel alive we need to step outside our comfort zone and just let the experiences wash over us. Soak it all in and process as much as you can and welcome the opportunity. It was pretty uneventful from Hong Kong to Singapore. I had a few hours layover there and spent the time patrolling the airport. I was really amped up now that my destination was so close. Lots of questions raced through my mind knowing that I would soon meet in person the woman that I planned to marry. What would she think about me when she finally saw me in person? Would she be as beautiful as her photos? How would her family react to me coming into their house and marrying their daughter and then taking her back to the US? What would her relatives think about me? What would Indonesia be like? I knew that all those questions and more would soon be answered. I started to get a bit anxious and nervous. I think it’s only natural to be anxious and nervous in unknown circumstances. It’s when we let those feeling paralyze us from action that they become problems. Finally I heard the call to board my final flight. It had been a long journey to reach this final phase of the trip. As we lifted off and flew over Singapore toward Jakarta I thought about how big the world was and how little of it I had actually seen. The flight to Jakarta was pretty short, about 45 minutes. Up to this point I had either been in an airplane or a climate controlled airport. So as I disembarked the plane the first thing that hit me was the intense heat and humidity. I’ve spent the majority of my life in Oregon where it rarely gets above 80 degrees in the summer and humidity is something we know nothing about. The heat in Jakarta felt like a blast furnace. My clothes and skin got sticky with sweat and I wondered if the customs agent would mistake the beads of sweat running down my face as nervousness. I was now really anxious to see Irene. What if she wasn’t outside waiting for me? I didn’t speak a bit of Indonesian so how would I communicate with everyone? The line for customs was really long and the heat even inside was intense. Finally after about an hour I made it to the front of the line and approached the looming glass of the immigration agent box. I slid my passport across the counter and under the window. “How long will you be staying?” he asked. About a month I replied. “Who are you visiting?” “Some friends in Bandung” I said. He glanced at me and then stamped my passport and motioned me through. After almost 24 hours and thousands of miles I had arrived. I located my luggage on the turnstile which was about the only luggage left there. I kept looking around for Irene thinking surely she would be at the airport now, especially since it had been well over an hour since I had landed. But she was nowhere to be seen. I started to panic a bit. I didn’t want to leave the airport and head outside into the unknown but at this point having spent 15 minutes looking around I had no choice but to find the exit. I headed toward what looked like the exit where I saw some security guards and some luggage scanners. As I started to place my luggage up on the conveyor belt a security guard motioned me over and asked for my passport. I handed him my passport and he smiled and took my suitcases and directed me around the security checkpoint. Ok, this is interesting I thought, but what the heck I’ll work with it. As soon as I got around this short scrawny kid asked if he could carry my luggage. I almost laughed because he wasn’t much taller than my suitcase and as it was I could barely move my 50lb suitcase. No thanks I said, I can handle it. He was really persistent so I gave him $5 and he smiled and ran off. Later when I told Irene this story she seemed shocked. Apparently $5 was a large amount of money. I hope he spent it wisely. Finally I was outside the airport and walking down a gated area lined with people all apparently waiting for friends or family. As I neared the end of the gated area I saw her standing there. It was as if a beam of light had come streaming down from the heavens and planted itself all around her. As I walked closer we locked eyes but then she looked away. She hadn’t recognized me! “Irene! It’s me!” I shouted. Finally, the recognition spread across her face. We hugged and smiled at each other. And that is how I met my wife. I hope you enjoyed this true story of how I met my wife. It’s a bit of an unorthodox meeting but I am finding more and more people that I encounter who have similar stories of meeting online and falling in love. I think there are some important lessons in all of this. The first is that we must overcome fear and self-doubt. We must take risks in life if we are to truly live. Had I given in to my fears of flying, my fears of traveling to a strange and foreign land I would probably not be happily married now for 9 years and have 2 wonderful sons. There is a great quote by Leo F. Buscaglia that says: “The person who risks nothing, does nothing, has nothing, is nothing, and becomes nothing. He may avoid suffering and sorrow, but he simply cannot learn and feel and change and grow and love and live.” How true this is to me. Without risk we do not live up to our potential. Without risk we won’t open ourselves up to others and fly half-way around the world to get married and start a wonderful life. Take a risk today. Happy Valentine’s Day! Keep moving forward to great things! Matt, you’ve shared this beautiful love story with me before, but never int his much detail. May the Lord continue to bless you and your lovely family! @Starla – Thank you my friend! May you be blessed as well. Hope you are well.